If you’ve ever fancied yourself as a bit of an alien hunter, then a new website, designed to allow you to do just that, will be right up your street. Announced at the TED (Technology Entertainment and Design) conference in Los Angles, SETILive opens the search for aliens to the masses. The SETI Institute (Search for Extraterrestrial Intelligence) hope to tap into some of the success enjoyed by the growing wave of citizen science, or so-called crowdsourcing, projects. Crowdsourcing websites were created by scientists to help them deal with the “data deluge” created by modern research projects. One of the earliest was the hugely successful Galaxy Zoo project, which was set up in 2007 by a frustrated (and over-worked) astrophysicist. In just its first year, more than 50 million galaxy classifications had been made by 150,000 Galaxy Zoo volunteers (or, Zooites as they call themselves). SETILive volunteers will be asked to search radio signals for signs of “unusual activity”. 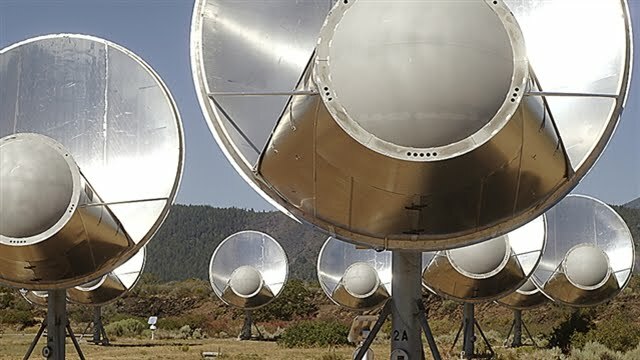 The radio signals will come from the Allen Telescope Array at the University of California, which searches the galaxy for radio signals that could indicate the presence of alien life. Most of the huge amount of data collected by the Allen Telescope Array can be searched automatically by computers, but sometimes the signals are too “busy” for the software to handle – it is this that SETILive volunteers will be asked to make sense of. "I'm hoping that an army of volunteers can help us deal with these crowded frequency bands that confuse our machines" explained Dr Jill Tarter who leads the science team. Volunteers will be asked to describe and classify radio signals as they come in. By processing the signals in real-time, any promising discoveries can be followed up by SETI immediately.